And did those feet, in (not so) ancient times, walk upon…well, yes, actually at one stage they were forced to. This adventure started as an early Christmas present to myself. 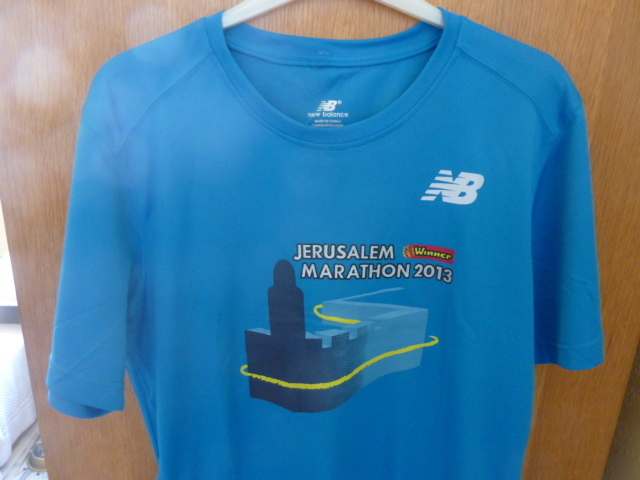 My son-in-law, he of the 64 full marathons at that time, said he was going to run the Jerusalem marathon and Mrs Marathon Widow decided she wasn’t going to go out there, so I decided I would like to accompany him. As there was a half marathon at the same time it seemed like the obvious thing to do, indeed it really would have been a waste of an opportunity to do my both first ‘big city’ and ‘overseas’ event at the same time. So everything was booked late on Christmas Eve. At that stage the thought of the run didn’t cause me any great concern. Although I had only done 2 official halves and a 15k before, I had done plenty of ‘that distance and further’ training runs over the previous couple of months. But on January 17th ‘something changed’; the stairs in The Sultan Palace Hotel, Zanzibar deceived me and I was left with a grade 2 quad strain, with a recommended recovery time of 4-6 weeks; with age to contend with I was expecting to be at the upper end of that range. That would take me to 28 February, the day before the Half! Not very hopeful. Well recovery did go well, better than I could have hoped, possibly the fact that I was participating in Janathon and so even with the injury did something gentle everyday helped, and I managed a comfortable 10k and an 18k in the 12 days before the day of the run, with very noticeable DOMS as the only aftermath, so I did begin to believe I would be able to complete the Half but with no expectations of a good time. 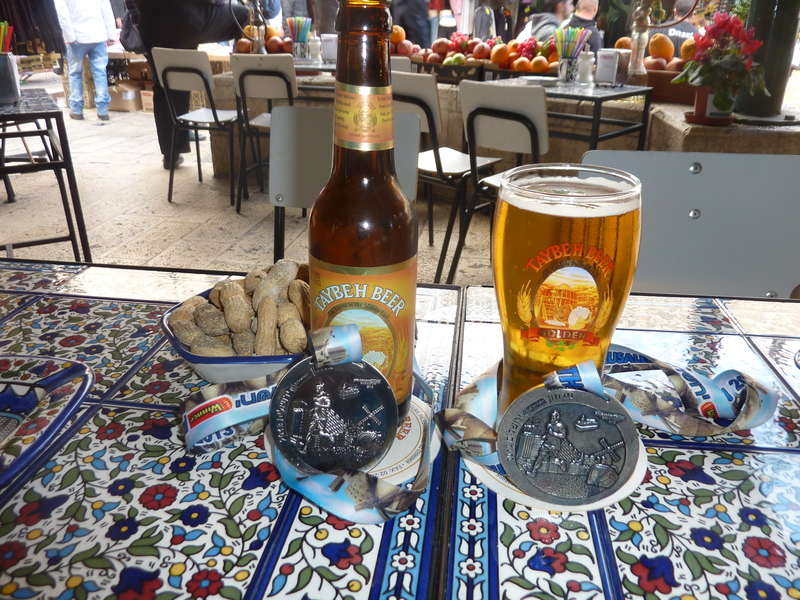 The later part of the hope was further strengthened when I looked at more detail into the course Quote from the website “Jerusalem is well known, as a very hilly city and the organizers have done their best to include some of the very best hills on the race course”. The profile of the course confirmed this. The 4/5k walk to the start, with the help of the impressive map reading skills of a group of Finns was made amusing irritating when 2 Americans joined us, insisting that they had the way there sorted, only to take us a considerable distance the wrong way down one road; we should have realised earlier that when there are locals, i.e. people wearing Kippahs, who are in running gear walking in the opposite direction they probably know best…But we still got to the bag drop and start with plenty of time to spare. If there has been a positive outcome from my injury, and I will attempt to make sure I keep it going, is that I am making a conscious effort to control the pace I run at, particularly over the first half of the course. I have always gone off much too fast and suffered at the end. So I started at what I perceived to be a comfortable pace, which turned out to be 5.3min/k over the first 10k. During the race the actually running did not prove a problem, the thigh strapping may not even have been needed. But the hills started to take their toll. “There is a green steep hill are many steep hills far away without a city wall, where our poor legs were crucified…” The sadistic course designer put the steep ones at the end, starting at the 17k mark and at that stage I quickly calculated that a sub 2 hour time was just going to be outside my reach. Only by a minute or so, but anyone who has done any running at all knows that senior amateurs like me cannot increase their pace by the amount necessary, especially at the end of a race with a HILL to come, to claw back even a minute. So I did the opposite. Not wanting to miss 2 hours by only a minute or so I eased up and actually did something very out of character, walked up some of that hill, and the shorter but even steeper one at the 20k mark. Actually I’m not really sure I had much choice in the matter, the hills had won. In the end, 2:05 was a perfectly acceptable time, if I had been asked at the end of January what I would have been happy with “starting and finishing would have been my answer! To put the whole race/course into perspective, Jon who I was accompanying and now a 66 marathon veteran (he had achieved a PB of 3:11 in the Seville marathon 5 days earlier!) said it was the most difficult city course he had run and he considered his 3:56 on this course to be at least equal to his achievement in Seville. Anyway a few ‘observations’ from a newb. It’s a shame that, on a course with so many sights to take in on the way round (yes, it was still possible to do that while running) there were no signs in English saying what we were running past. 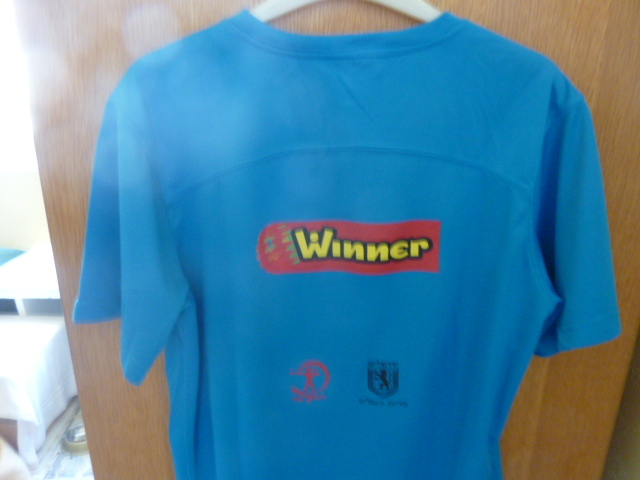 I’m sorry, but event T-shirts should NOT be worn until after the race has finished! You might have paid for it as part of the entry, but it hasn’t been earned until the 21.1k/42.2k is over. Is it really necessary to push through a gap half the size of the average runner, or cut across in front of someone (me!) in order to slap hands with random spectators. OK these are minor irritations, the whole experience was brilliant, and has certainly whetted my appetite for more of the same, maybe even sooner than would normally be expected? And then there are the extra bonuses of the run far away from home that is on an unusual day, an excuse to start drinking unusual beers at midday on Friday in the sun. Good to hear that you too recovered from injury to make your race albeit on plan b or c. Looks like an interesting race, as long as you like hills! I was so pleased to be able to run it. Very hard work, and I don’t like hills. Something flat next, the Marseilles Half on 24 March! Thanks, a really interesting place for a run, maybe just once though! Woo hoo! You did it & in better form than you expected, considering that recent prior injury. Well worth the trip, it sounds like. Well done! Thanks, going in without any real expectations was quite a weird experience, but I think things will be different in Marseille in just over 2 weeks time!